Ruffa of Jailex Couture contacted me a few weeks back and sent me some samples of the much-raved Krave Minerale Cosmetics. I've seen it in vlogs and various local beauty blogs. She wanted me to try out selected products that she thinks my skin would enjoy. Makeup wise, Luxurious Perfection provides great coverage. It goes well with my liquid foundation as well as alone. The finish has a slight sheen to it but not quite visible on the skin. 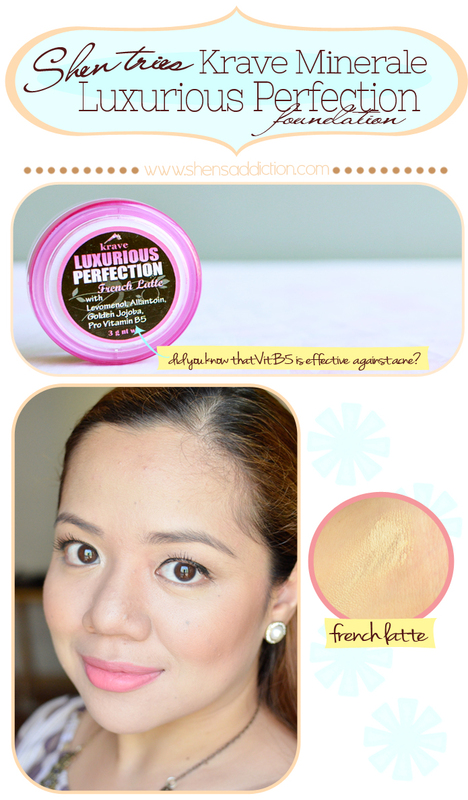 It gives natural-looking effect while hiding away blemishes with it's medium to heavy coverage. I like that it's photogenic and allows my skin to breathe. A great mineral makeup foundation to use on a daily basis. French Latte is the lightest shade, I think, and it matches m medium fair skin tone. For many women I know, a lot prefer mineral makeup. It has lesser ingredients, great for sensitive and acne-ridden skin! It also contains no preservatives, allergens and other harmful chemicals. A great addition is that it's affordable and easily available. If you're tired of cosmetics breaking you out or just find them too expensive, then you might want to try mineral makeup instead. There are a lot of mineral makeup available now. Krave Minerale is one of the newest players in town. They are highly against animal-testing and boasts of using only natural and organic ingredients. Their makeup line doesn't only stop with colors but they also offer solutions such as skin care and other cosmeceutical products. Find out more about Krave Minerale at Jailex Couture. Visit their Facebook Page today. Your skin looks amazing! I love your whole look in this post! Can you do a breakdown of all products used? I asked something about the product in same blog few days before as I had some questions regarding the use of the http://www.revitoldirect.com/ and I got the answers now.